A derelict Victorian hospital looks set to be demolished amid reports of drugs and prostitution, and fears for the safety of young trespassers. Ysbyty Minffordd in Bangor closed in 2006 and was bought in 2011 by a firm planning to turn it into a specialist care facility employing 100 people. But the building went back on the market in 2017, with no work done and planning approval having expired. Gwynedd Council is being asked if it can be knocked down on safety grounds. Built in 1895, the hospital became a convalescent home in 1948 and served as a psychiatric unit for elderly patients between 1988 and 2006 when it closed. 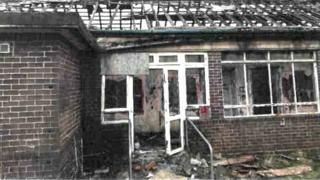 Loughborough-based Rushcliffe Care Ltd, which has been trying to sell the premises for £400,000, now wants to demolish it after fire safety experts warned it had become a magnet for anti-social behaviour. A joint report by police and a fire service arson prevention officer found all the buildings to be "unsafe". "The risk posed by the site, particularly to children, has the potential to be significant," they warned. It was "known to be a meeting place" for youths, who police feared were being targeted by drug dealers. Officers also reported prostitution at the site, which was littered with used needles. Homeless people were also reported at the location, despite it being declared unsafe. Police believed the "escalation" in anti-social behaviour was "significant", the report added, warning that the site owners "may end up bearing some responsibility" if anyone came to harm. Trespassers who caused damage to the building and stole materials were putting themselves at risk from unstable structures and asbestos, the report added. "Demolition of the buildings and site clearance would appear to be the solution," it concluded. Gwynedd Council is expected to make a decision in the coming weeks, with the company proposing demolition on 30 April if given the green light, according to the Local Democracy Reporting Service.